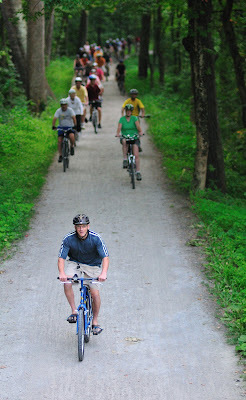 Recently listed by The Plain Dealer as one of the region's free and fun attractions, Century Cycles Night Rides on the Towpath Trail are a great way to enjoy a summer night without breaking the bank! Tomorrow's Night Ride starts at 8 p.m. in the parking lot of the Peninsula store. Bike at your own pace for a 12-15 mile ride that takes about two hours. Bike lights and helmets are required. Can't join us tomorrow? Then plan to join us in the future! The remaining dates for 2009: July 25, August 8, August 28, September 19, or October 9.